Upon un boxing, I noticed the ammunition was spotted and had some kind of residue on about half of the cartridges. Was told by lucky gunner that this was due to the drying process, and that they air dried instead of whatever method Federal uses to dry them. Had a few failure to feed so I disposed of the rest of the unused box. Would not recommend. As I told Lucky Gunner, they looked like a sloppy job of reloading. I have been shooting for over fifty years. I find your inventory and prices to be the best on the Internet. I will definitely be doing business with you from now on. Usually .40 is 180gr. so 165gr. is a lighter load & makes it more comfortable shoot. Ordered 300 rounds and It arrived quick I received exactly what I ordered. I will continue to support this company. Everything about this ammo is top-notch. Great target ammo. No jams in my G23. Getting it at my front door just days later ordering is icing on the cake. I just recently started buying ammo here and will continue to do so. This is BY FAR the best service I've ever had. Can't say enough great things about LuckyGunner. I am COMPLETLY amazed by the quality, speed of the order process, and friendly staff at Lucky Gunner!!! Thanks for your rapid service!! Great ammo. I purchased a few boxes because it was in stock. A bit pricey, but at least I received the ammo within 3 days instead of waiting a month like other websites. I purchased 500 rounds with plans on purchasing more if they held up and they did. Great round for the price plan on buying more. 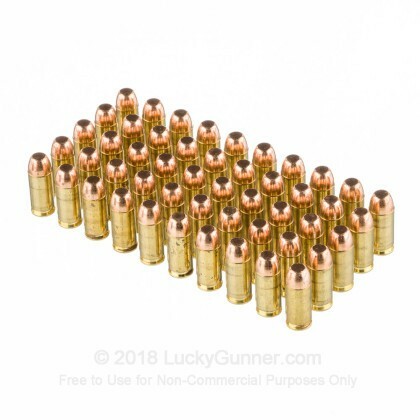 Great ammo, shot hundreds of rounds and not a single problem. Great value too. 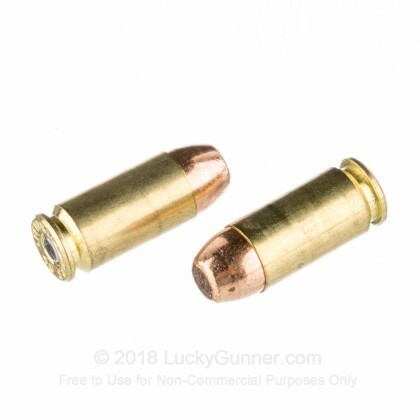 I use this ammo in our local IDPA and Action Pistol Matches. They haven’t given me a thing to complain about. Accuracy and reliability are dead on the money. I wanted to see if the 165 gr rounds were as accurate as the standard 180 gr rounds. I'm happy to say this Ammo shot 12 rounds into a 2 inch group at 15 yds. This ammo shoots great. It is very consistent, fires every time and ejects every time. I had 600 rounds drop shipped to the hotel I would be staying at out of town. Ammo arrived well before I arrived. Much less stress than running around hoping to get what I need on a Sunday afternoon! Prompt service! Product -- Excellent! I received this product promptly after ordering it. It worked perfectly in my GEN 4 GLOCK 23. 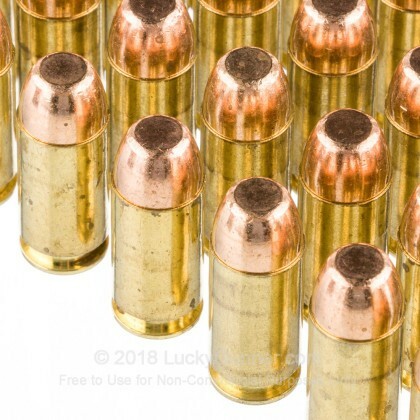 Ordered 200 rounds of this and it did not jam nor fail to fire in my Glock 22. Everything about the 165gr round is great and personally, I prefer the 165gr for plinking. The only issue I had was, that due to severe weather in the East and Central parts of the United States, shipping was delayed. This was not luckygunner's fault since they did ship it just as they promised on the same day. Tracking did however was a let down by fedex. Other than that slight delay, definitely will buy from you guys again!! I have used these rounds for sometime now and have never had an issue. This was my first time buying them from Lucky. 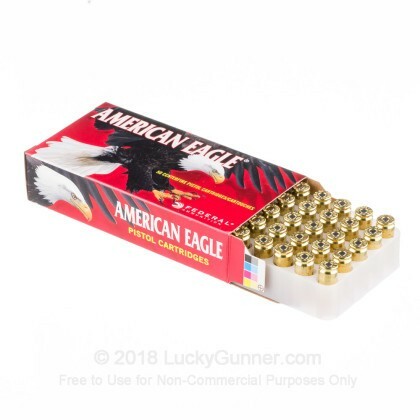 No complaints with the ammo and ZERO complaints with Lucky Gunner. I plan on ordering more of these soon. Great ammo. No failures of any kind. Would recommend and will certainly purchase again. 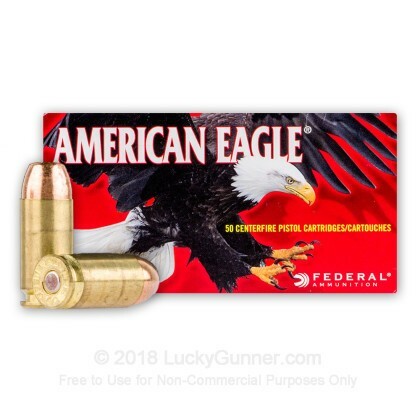 I have literally shot tens of thousands of rounds of this 40 cal ammo from American Eagle and never had a single problem - ever. 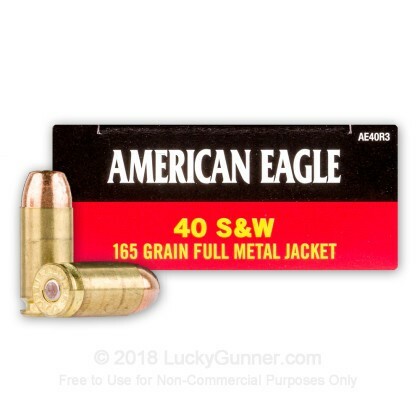 We also have this 40 S&W - 165 Grain FMJ - Federal American Eagle - 1000 Rounds ammo in stock in a bigger quantity.